That’s the title of today’s homily: Persevering Peter. Now when we think of Peter—and here I’m talking specifically about Peter before the Resurrection (in other words, the Peter we encounter during the earthly ministry of Jesus)—perseverance is probably not the first word that comes to mind. Some words that do come to mind when describing the Peter we see during Jesus’ 3-year ministry (at least they come to my mind!) are words like: impulsive, weak, inconsistent, impatient, erratic and hot-headed. But even back then he was also a man of perseverance—almost incredible perseverance. Which is probably one of the biggest reasons why Jesus chose him to be the very first pope! Can you imagine how frustrating and how discouraging it can be at times to be the spiritual leader of a worldwide community of faith that includes not only some of the greatest saints on the planet, but also some of the worst—some of the most reprehensible—sinners on the planet? 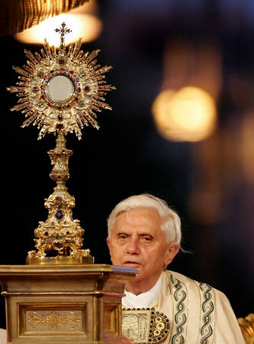 Obviously our present Holy Father, Pope Benedict, needs an immense amount of perseverance to lead the Church in the midst of those circumstances. And so did Peter 2,000 years ago! Well today’s gospel reading picks up where last week’s left off. Jesus begins to teach his apostles that he will be a suffering Messiah, not a great earthly ruler like King David (which was the kind of Messiah the Jews were expecting at the time: someone who would get rid of the Romans and make Israel a great earthly nation again). Why, oh why, did he call Peter, “Satan”? It’s because at that moment Peter was saying to Jesus exactly what Satan would have wanted him to say to Jesus! Satan, you see, did not want our Lord to go to the cross on Good Friday, because he knew that if Jesus died on that cross his kingdom would be destroyed—since the sacrifice of Jesus would make it possible for every human person to avoid hell and go to heaven! 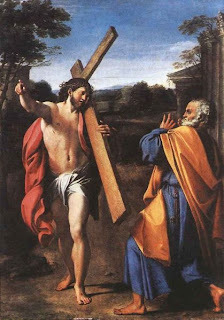 Coming back now, to Peter’s dialogue with Jesus: If you had been in Peter’s shoes that day, what would you have done? How would you have responded? Try to imagine this: Jesus, the Messiah, the only-begotten Son of the Father, doesn’t just reprimand you (that would have been bad enough! ); he doesn’t simply tell you that you’re wrong—he actually goes so far as to call you “Satan”! He equates you, in some way, with the devil himself! I think most people, if they’re truly honest with themselves, would tell you that they would have been so undone—so completely devastated by these words of Jesus—that in all likelihood they would have walked away in despair and never come back. I know I would have been tempted to respond in that way. But Peter didn’t! That’s what’s so amazing about him. He didn’t throw in the towel; he didn’t despair. In spite of the horrible feeling he must have had on the inside, he didn’t walk away like the rich young man did when Jesus challenged him to give up all his possessions. Peter took the rebuke, and persevered. He kept on following the Lord. Peter’s perseverance was also evident at the end of the Bread of Life Discourse in John 6: Jesus told the people that he intended to give them his Body and Blood for their spiritual nourishment, and most of them freaked out! Even a lot of our Lord’s disciples walked away. Even on Holy Thursday, after he denied the Lord 3 times, he didn’t give up! Judas did, but Peter didn’t. And let’s remember, their sins were both grave: both betrayed their Lord and Savior. Judas despaired and hung himself, but Peter came back and repented. 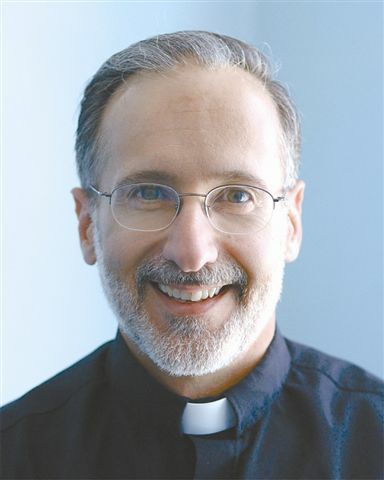 I mention all this today because there are many times in our lives when we can be tempted to give up on God and our Catholic faith: when a loved one dies suddenly and unexpectedly; when we come down with a serious disease (Parkinson’s, cancer, heart disease—whatever it might be), when we’re praying for something for a long time and God doesn’t seem to be answering; when we find ourselves falling into the same sins over and over and over again. In situations like these it would be good to say a prayer to St. Peter, asking for his special intercession so that we might receive from God the grace we need: the grace of perseverance—a grace that Peter had in such great abundance. We need to pray because even persevering people can be tempted at times NOT to persevere! Such was the case, apparently, even for Peter himself—at least on one occasion. Some of you have probably heard the story. It’s not found in the Bible, but in a very ancient Christian tradition. The event happened during the terrible persecution of the Church under the Roman Emperor Nero. Peter, of course, was Pope by then—the official leader of God’s New Testament people—but, in the midst of all the violence and confusion, he decided that enough was enough. So he left the city. He abandoned his post—and his flock—in fear, and fled from Rome on the famous Appian Way. Peter got the message. He turned around; he went back; and he courageously led the Church until he was martyred—crucified upside down—in that area now known as St. Peter’s Square. People who persevere can sometimes be tempted—even strongly tempted—not to persevere. But in the end, by the grace of God, they remain faithful. Thirty-one-year-old Leah Darrow was the Friday night speaker at this year’s Steubenville East Youth Conference, which was held at URI on the weekend of July 24th. Leah has become a well-known and highly-respected chastity speaker in recent years, but before that her big claim to fame was that she was a contestant on “America’s Next Top Model”. She was on during Cycle 3 of the series, which aired back in 2004. When she gave her personal testimony during the conference, she said that she grew up on a farm in Oklahoma, the oldest of six children. Her family practiced the faith: they all went to Sunday Mass; they even prayed a Rosary together every evening. However during her teenage years Leah began to drift spiritually. She experienced what she now describes as a “slow fade” away from her Catholic faith: she got a new circle of friends who were not the best influence on her (that happens to a lot of teens—even some teens here in our community), and she eventually embraced a very hedonistic, materialistic, self-centered lifestyle. In the midst of all this she began to do some modeling, and after she graduated college she decided on a whim to try out for the so-called “reality show,” “America’s Next Top Model.” I say “so-called” because—as Leah said during her testimony—“there’s nothing real about reality TV”! So often, as most of us know, they film scenes of conflict between the contestants on these shows. But, as Leah noted in her talk, most of the time the producers and directors of the programs create the circumstances that contribute to the conflict. (That’s the part they don’t tell you.) For example, Leah said that she and the other contestants had no privacy whatsoever when they were competing. In fact, the producers took all the doors off the hinges in the hotel where they were staying—and that includes the door to the bathroom! Consequently, these young women had men (that is to say, male persons) following them around with cameras 24 hours a day. Literally 24 hours a day! They also didn’t give the contestants enough food or enough rest. So I ask you: Would you or would you not be a little bit edgy if you were hungry and sleep-deprived and living in a hotel with a bunch of strangers—a hotel in which you had absolutely no privacy and no time for yourself? Leah was eventually eliminated from “America’s Next Top Model,” but her appearance on the program opened the doors to a number of big modeling jobs. Of course the interesting thing is that during this part of her life she really wasn’t happy. She had a measure of fame and notoriety, she was making a good bit of money, she had physical relationships with a number of different men—but she had no peace. Finally it all came to a crisis point during a big photo shoot that she did in New York City for an international magazine. She had been asked to wear a very skimpy, immodest outfit—more revealing than anything she had ever modeled before. She said that she felt “uncomfortable—scared—exposed” and she suddenly came to the realization that she had been squandering the gifts God had given her. She said that she had a “St. Paul moment” in which she imagined herself standing before Almighty God at the end of her life, wearing the outfit she had worn in the photo shoot, with her hands—her cupped hands—out in front of her, as if she was offering what was in them to God. The problem was that her hands were EMPTY, symbolic of the fact that she had nothing good to offer to God, based on the way she had been living her life in recent years: no acts of love, no acts of selfless charity—nothing. So her dad came. He got into his car, drove all the way from St. Louis to New York, encouraged his daughter to make a good confession, and then actually took her to church so she could meet with a local priest and receive the sacrament. The rest, as they say, is history. Leah got her life together, renewed her faith, got reconnected to the Church, and has since become a very effective speaker at conferences like the one our teenagers attended at URI a couple of weeks ago. She’s now doing some great things for the Lord. But it all started at that decisive moment when she was willing to stand apart and stand alone for Jesus Christ! That’s the key point to remember, and it’s why I shared her story today in this homily. Think about it. If Leah Darrow had not been willing to confront that photographer during that photo shoot and walk out the door, she would still have ‘empty hands’ at the present time, she would still be miserable—more miserable than ever—and her life would be going in a completely different direction. I say this question was crucial and decisive because the answer they gave would determine a lot of things: It would determine their level of loyalty to Jesus; it would determine their willingness to listen to Jesus and obey him; it would determine their willingness to follow Jesus when things got tough. You see, if they thought that Jesus was just a great teacher or just a great philosopher, they could justify disobeying him or disagreeing with his “opinions” or walking away from him when things got difficult. But if he was something more—if he was the Messiah who had a special and unique relationship with the heavenly Father—then they couldn’t justify any of those things! They would have to be loyal to Jesus and listen to Jesus and obey Jesus and follow Jesus no matter what! Now perhaps the other apostles—or at least some of the other apostles—were thinking the same thing. Perhaps some of them had the very same belief about Jesus. But we don’t know that for sure. In fact, I think it’s much more likely that the other 11 did NOT believe what Peter believed—at least not fully. I say that because, according to Matthew, Mark and Luke (the 3 gospel writers who record this event for us), none of the other apostles said anything after Peter made his profession of faith. They were totally and completely silent. Which leads to the obvious question: If they did believe the same thing about Jesus that Peter believed, then why didn’t they speak up immediately after Peter did? Why didn’t they all say, “Yes, Jesus, Peter’s right. We agree. You are the Messiah, the Son of God!”? Their silence, I think, says a lot. To his great credit, Peter was not influenced by whatever hesitancy or doubts his fellow apostles were experiencing. He believed Jesus was the Messiah and the Son of God—and he said it! Standing up for Jesus Christ and his truth ALWAYS has its reward: sometimes in this life, always in eternity—and sometimes both here and in the hereafter (as was the case for Peter). For Leah Darrow, the reward is coming as she sees the lives of young people—and not-so-young people—change for the better through the talks she gives in settings like the Steubenville East Youth Conference. When you face those attacks at work or at school—or even in your own family—do you respond like Peter and Leah Darrow? Or do you remain silent? That’s the key question of the day for all of us. To those who of you who do respond in defense of Christ and his Church—to those of you who stand up and affirm your faith like Peter and Leah Darrow—let me give this word of encouragement: When your life is over and all is said and done, you’ll be very glad you did. All those common expressions are ways of affirming the very same truth: Quiet is good! Or to use another well-known adage, Silence is golden. And these days, very few of us have enough of it—including yours truly. We live, unfortunately, in what has to be the noisiest era of human history—most especially because of all the technological gizmos that we have at our disposal, many of which were sold to us with the idea that they would make our lives simpler and easier. And, to some extent, I suppose they have. But they’ve also caused us to be bombarded by noise—lots of noise—almost incessant noise—all day long. We even have what I would call “silent noise” to contend with. (I know that sounds like an oxymoron, but it isn’t.) Silent noise includes activities like text-messaging and tweeting and emailing—you know, all those things we do when we’re not talking on the phone, listening to the iPod or the radio, playing a video game, or watching television or a movie! Is it any wonder that so many people in our modern world can’t deal with silence? The lack of noise positively freaks them out! Is it any wonder that so many of our young people can’t focus their attention on one thing for more than 2 minutes? Psychologists say it’s ADD or ADHD, but at times I think it’s because these young people “OD”! They OD—they “overdose” so to speak—on the non-stop noise in their lives! I mention this today because this noise saturation that we all have to deal with directly affects our relationship with God. That’s because our most profound encounters with the Lord usually happen in the quiet silence of our hearts. Based on this morning’s first reading you might choose to call this “the Elijah-rule of the spiritual life.” There, as we heard a few moments ago, Elijah the prophet encounters God on Mt. Horeb. But notice that this encounter does NOT happen in the noise! It doesn’t happen in the howling wind and crashing rocks; it doesn’t happen in the earthquake or in the noisy havoc caused by the fire. Elijah meets the Lord in the “tiny whispering sound”; that is to say, in an experience of almost total silence. So, I ask you, how often do you go before the Lord in silence? Do you ever go to the Lord in that way? Do you make an effort, for example, to be here early for Mass each week so that you can spend a few moments in quiet prayer, preparing to meet your Lord in word and in sacrament? And how about Eucharistic Adoration? Adoration of the Blessed Sacrament provides us Catholics with the perfect opportunity to encounter our Lord in silence. And that’s true even if the Eucharist is in the tabernacle and not exposed in the monstrance on the altar. Now if you’re like me you do way too much talking and not enough listening during Adoration (and that affects the quality of the experience, for sure)—but at least during Adoration the atmosphere is right for us to have a profound encounter with our God. 1. First of all, Adoration provides us with an opportunity to hear God speak to us through a word of Scripture that we might happen to read, or even in the silence of our heart. 2. Adoration provides us with an opportunity to take our important decisions to the Lord, and to receive guidance and insight from him on those decisions. 3. Adoration opens us up to special blessings from the Lord. 4. Adoration gives us an opportunity to evaluate our own lives soberly and accurately in the light of God’s revealed truth (that is to say, it gives us an opportunity to examine our consciences—which we all need to from time to time). 6. Adoration gives us the chance to reprioritize and to be revitalized. 7. And, finally, adoration gives us the opportunity to—in the words of the Letter to the Hebrews—“cast all our cares on the Lord” who cares for us! This, of course, is not an exhaustive list of possible benefits. Some of you could add others, I’m sure, based on your own personal experience of praying to the Lord in this way. St. Peter of Alcantara said, "Our Lord in the Blessed Sacrament has His hands full of graces, and He is ready to bestow them on anyone who asks for them." Archbishop Fulton Sheen (who made a Eucharistic Holy Hour every single day of his priestly life) said, "Neither theological knowledge nor social action alone is enough to keep us in love with Christ unless both are preceded by a personal encounter with Him. Theological insights are gained not only from between two covers of a book, but from two bent knees before an altar. The Holy Hour becomes like an oxygen tank to revive the breath of the Holy Spirit in the midst of the foul and fetid atmosphere of the world,"
And again, Mother Teresa: "When the Sisters are exhausted, up to their eyes in work; when all seems to go awry, they spend an hour in prayer before the Blessed Sacrament. This practice has never failed to bear fruit: they experience peace and strength." 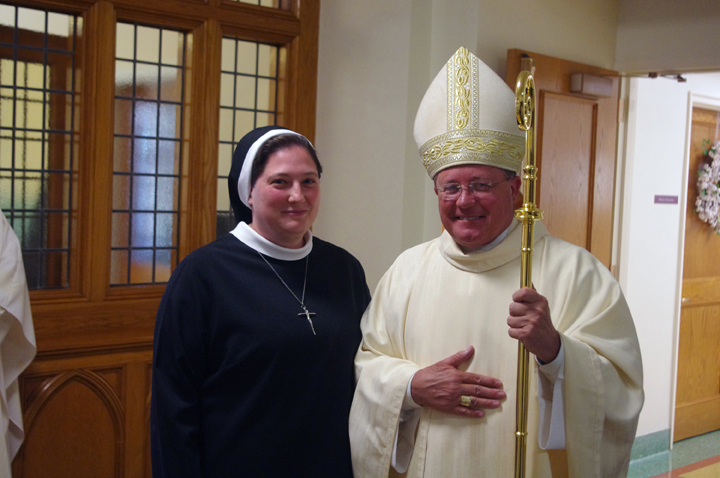 Sister Christine with Bishop Michael Cote of Norwich, who celebrated the Mass. Last Saturday I was honored to concelebrate the Mass at which Sister Christine Hoffner took her final vows for the Apostles of the Sacred Heart of Jesus, an order of religious sisters whose provincial house is located in Hamden, Ct. Although she was never a member of St. Pius X Parish, Sister Christine used to attend our Thursday night youth group when she was in high school and college. We've been praying for her at our Sunday Masses for many years, along with the others in our community who are studying for the priesthood, the diaconate or religious life. May God bless you, Sister Christine, with many years in his service!